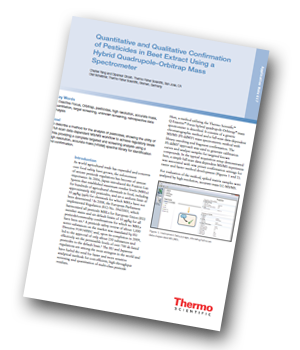 Thermo Fisher Scientific has produced an application note describing the quantitative and qualitative confirmation of pesticides in beet extract using a hybrid quadrupole-Orbitrap mass spectrometer. The goal was to describe a method for the analysis of pesticides, showing the utility of a full-scan data-dependent MS/MS workflow to achieve regulatory levels while providing a complete targeted and screening analysis using a high-resolution, accurate mass (HRAM) spectral library for identification and confirmation. of stricter pesticide regulations has become of utmost importance. The EU and Japanese regulations are among the most stringent in the world and have fueled the need for faster and more sensitive analytical methods for cost-efficient, high-throughput screening and quantitation of multi-class pesticide residues. spectrometer is described. It consists of a generic chromatographic method and a full-scan data-dependent MS/MS (FS-ddMS2) mass spectrometric method with library searching and fragment confirmation. The FS-ddMS2 approach was used to generate calibration curves and analyse samples for targeted known compounds. In the typical acquisition setup demonstrated here, a simple full-scan data-dependent MS/MS experiment was associated with new preset confirmation settings for easier and faster method development. For evaluation of the method, spiked matrix samples were analysed by high-resolution, accurate-mass LC-MS/MS. The benchtop Q Exactive Focus MS provided easy access to full quantitative, confirmation, and screening data in a single injection. The high resolution and mass accuracy enabled quantification of the compounds over a wide dynamic range (0.05–200 ng/mL) with linear fit, correlation better than 0.99, and %RSD below 15%. Confirmation by the precursor-selected MS/MS gave an option to use spectral and library matching and pattern recognition within TraceFinder software. The new environmental and food safety HRAM spectral library provided more confidence in the data with its multiple, high-resolution spectra at numerous collision energies for use in any experiment.